_I believe I can "fly"
We served 160+ bowls of Penang Prawn Noodle recently. This lot was good with nice balance of flavours with sufficient prawn stock. When we did not need to add too much of the other flavourings (esp Ikan bilis and chicken stock), we knew we had a good broth coming. My mum's version does not use pork bones which changes the flavor and is nice in its own way. And it is often used commercially because dried shrimps and ikan bilis are expensive. I normally cook my Mum's version to give diners a unique taste of good home cooking. I will write my cooking notes here to guide the team when they need to do this again. I have posted the basic recipe here and here, and also some further explanation on the science behind what makes the Penang Hae Mee broth so appealing. The nature of noodle recipes is such that it makes sense to cook a larger lot as the amount of prep work is the same. However scaling it up for 160 is a challenge and one has to be careful not to assume that some of the ingredients also scale up proportionately from the base recipe. Tasting and experience is important if you want to serve it for so many diners. The instructions below are definitely not for beginner cooks. While it may seem expensive to keep to the ratio of 100gm of prawns per bowl but only the heads and shells are used. Most of the prawn meat can be frozen for future use. If you garnish per bowl with two medium size prawns (4 pieces if halved), this works out to about 40 gm (a kilo= 50 prawns -> 20 gm each). This means you will have a leftover of meat from 3 prawns for every bowl you make for other uses. Another way of putting it is to say that for every kg of prawns you use, you only need to use 400 gms of meat. Pork fat to make fried lardon and lard/oil. We added about 600-800 ml of lard oil in total into the stock. Peel prawns. Marinate the prawns (to be used for garnishing) with corn flour for about 45 minutes. The flour will help remove the blood, scum and firm up the meat. For the rest of the meat, we froze it for use on another occasion. We stir-fried the dried shrimps in the wok with some oil for about 15 minutes. Then we added the prawn heads/shells. We have a large wok but we needed to do this in two batches. We fried till the shells turned into an orangey hue (see photo). Blending the shell/shrimp stock: We put the fried shells/dried shrimps into the two large rice cookers and added tap water till the pots are sufficiently covered with water. We used a heavy duty stick blender. If the blender gets too heated up, it will auto shut off and so we needed the stock to be cool at this point. Pulverising the shells and dried shrimps took only a few minutes. We heated up the rice cookers and when it started to boil, we blanched the prawn meat. We did it in batches to cook the prawns quickly and ensured the meat stayed firm (read my tip post on cooking prawns). It can be removed when the meat turns orange or red. Don't overcook. We switched off the rice cooker and let the broth steep overnight for maximum extraction of the prawn flavours. Meanwhile, we slowly fried the cubed pork fat into lardon and glorious lard oil :) This process cannot be rushed to ensure the oils are mostly released and the lardon shrinks before we raise the fire to brown the lardon. Sambal chilli: We blended the shallots. Next, we heated up some of the the lard oil in a wok and added the blended shallots. We "sweated" the shallot paste for 15 minutes. Then we added the 6 packs of chilli paste and simmered for another 20 minutes. Next day, we boiled some water in a separate pot and added the ikan bills. Note: this broth can also be prepared within a day - just prepare the shells/shrimps stock earlier in the day. We prepared the garnishing ingredients. Eggs were boiled and sliced (when cooled). Kangkong was cleaned, cut and the hard parts snipped off. The pork loin was cut into blocks of 6 inch in length (with it usual width in diameter) and put into the boiling stock to cook for 30 minutes. We removed, let it cool and then slice it. The next stage was to combine and flavour the stock. The two pots of prawn stock and the pot of ikan bilis stock was combined into a huge pot. Added belachan, chicken stock, rock sugar, sambal chilli and lard oil. I had to taste along the way to ensure good balance and smoothness of the stock. Here is where "palate memories" will help as I am familiar with my Mum's version. We simmer the huge pot in very low fire. Bee Hoon was soaked in water for about 30 minutes. We began to prepare the bowls (in pic) beforehand. We strained the stock into one of the large rice pots and kept it warm. When it was time to serve, we blanched (in boiling water) the soaked bee hoon, mee, bean sprouts & kangkong in the bowls. Then garnish with pork, prawns and eggs and then added the hot rolling broth. Topped with home fried shallots and it was served. We had lardons and sambal chilli at each tables for diners to help themselves. The amount of broth needs to cover all the mee/beehoon in the bowl. We made some very good bowls of Prawn Mee. It can be improved if we used home-fried shallots and in future we should as it is very important to this version of prawn mee. The blended heads and dried shrimp adds flavours and texture to the stock and does not need to be sieved away. To do this, separate prawn heads and shells. After you put the shells in the main stock, sieve it out (along with the lkan bilis). Blend heads and dried shrimps finely. Put into the stock. Place the fried shells in a pot. Beautiful colour when the prawns are fresh. We could tell that the stock will turn out good when there was a golden foam. We needed two pots to steep the prawns and let the flavours develop. then washed and blanched in batches. They turned out beautifully. It was a church event using the church kitchen. I love all your recipes and have tried a few of them with much success. However, would it be possible for you, when next entering a recipe, to include the amount of servings or persons the dish will serve. This will be most helpful in deciding whether the ingredients I have at home will be sufficient for 2, 4 or 6 etc. 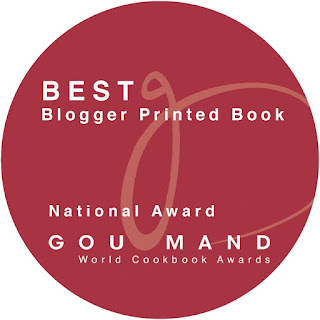 Thank you and keep your delicious and beautifully photographed recipes coming!!! God Bless!! 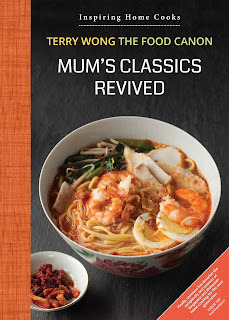 Hi Terry, I read through all your 4 articles about your mum's Penang Hokkien/Prawn Mee, but this article include "Lemon Grass" under the ingredients which others do not. Do you actually put Lemon Grass in the Prawn Mee? Hi Hong - I often add lemon grass but as you can see, I regard it as optional. Thanks for your lovely recipe. Trying it out overseas where my prawns come frozen and headless. Hope to recreate this recipe one day with fresh, intact prawns. This cooking blog celebrates a cook extraordinaire, my late Mum aka Auntie Ruby. Having grown up a Malaysian, but now a Singaporean, the recipes here are mostly of Southeast Asian influence. Read more here. Join TFC Facebook for tips & photos.